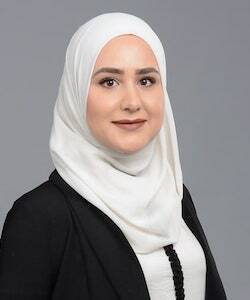 Manar Srajeldin earned her Honours Bachelor of Sciences from the University of Toronto in 2011 and her Honours Bachelor of Laws from the University of Leicester in 2013. During her time at the University of Toronto she was the Vice President of Les Étudiantes Francophones. As a law student she took part in various moots and successfully advocated on behalf of the European Law Students Association in numerous debates. Manar was called to the Ontario bar in 2016 after completing her articles at the Ministry of the Attorney General, Crown Law Office-Civil. Manar's practice encompasses all personal injury litigation including, serious and catastrophic motor vehicle collisions, motorcycle and bike accidents, slip/trip and falls, long-term disability claims, Criminal Injury Compensation Board cases and dog bite claims. Manar has appeared before various levels of courts and administrative tribunals including the Superior Court of Justice, Court of Appeal, Criminal Injuries Compensation Board, Social Security Tribunal and Small Claims Court. Manar executes a level of integrity and pride in achieving successful results for her clients. She demonstrates a distinct compassion for her clients and exhibits a client first attitude. Her strong interest in medicine, coupled with her background in biology and psychology, allows her to put her skills to good use in advocating on behalf of her clients. Manar is fluent in English, French and Arabic. She is a member of the Ontario Trial Lawyers Association and Ontario Bar Association. In her free time, Manar enjoys painting, singing, yoga, traveling and experiencing different cultures and foods.